Our lives begin to end the day we become silent about things that matter.Â Dr. Martin Luther King Jr.
American Muslim Voice Woodland chapter held its second annual multi-faith peace picnic on Saturday, May 23, 2009, at Fren Park. 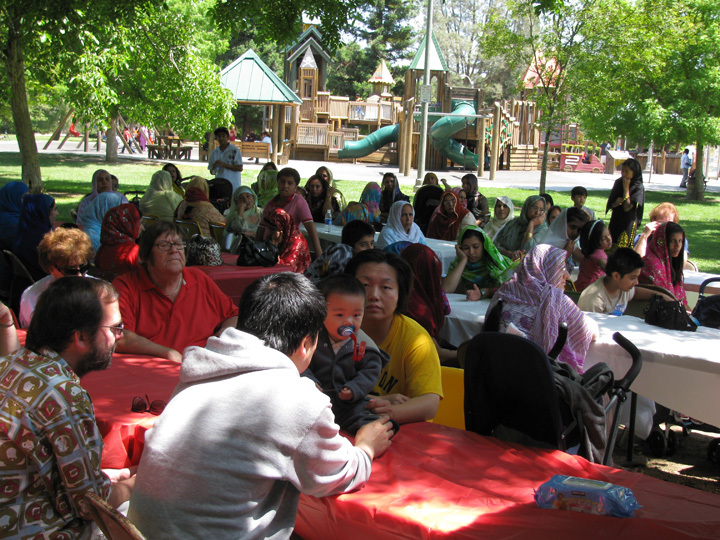 Like last year, the picnic was well attended by different faith and ethnic groups. It attracted people near and far. AMV Woodland chapter President Muhammad Usman Sadiq was MC of the event that began with the recitation of the Holy Quran by Qari Amir Hussein of Woodland Mosque. Unlike last year's very hot day this year the weather was just perfect and Fren Park in Woodland is a great venue for the kids to play and families to enjoy. Cooperation and participation by different communities was wonderful. It surely helped in brining different communities together. A special thank to Yolo County Sheriff Ed Prieto who cancelled an appointment in Bay area to attend this picnic and address the audience. Like Skip his talk was very inclusive and supportive. The Sheriff said that like Muslims he also belongs to a minority as he is a third generation Mexican American. He said he understands minorities’ issues and anxieties. Sheriff Ed Prieto went on to say that his door is always open to the community. Rev. Bill Schroder of Woodland appreciated the efforts of the Muslim community to bring closer various faith groups. Shirly Schroder was also present at the event. Also Bishop Bill Marble, a Woodland Council Member, shared his long standing friendship and interaction with the Muslim community of Woodland and his active participation and support of the community events. His wife, Sandy, who always shows support for our events was also present. Rev. 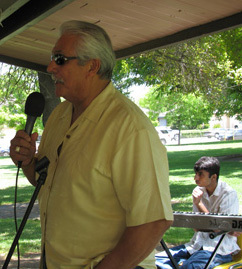 Ardith Allread of United Methodist Church also attended the picnic to expressed his support for AMV’s multi-faith event. Michel Hirsch of Davis Synagogue entertained the audience with a Hebrew song, Shalom. Trudy L. Frazen of Amercian Luthran Church suggested that the guests, particularly kids, should make presentations. At her suggestion few people took the opportunity and expressed their views. Zulfikar Sindhu stressed on the need of people to people contact to know each other, to understand a nd get along. Another young student, Farah Amjad said that we should always think above cultural and religious prejudices. A very special thanks to Librarian Sandra Briggs of Woodland Public Library. 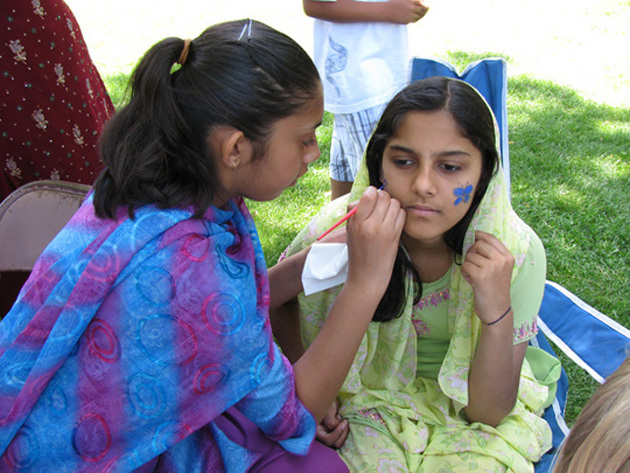 She was the official face painter and the story teller of the event. Dozens of attending kids flocked to her work station under a tree and had a lot of fun. Mr. Jim Smith editor of local Daily "The Daily Democrat" also attended the event briefly with his wife Penny. He had to be somewhere else on something already planned but they came just to show their support. Rev. Norman Callaway of Holy Rosary Woodland and Dr. Hamza Elnikhal from Davis had other pressing engagements as well but to show their support they briefly attended the program. This showed every one's commitment to community building and their appreciation of this event. We are very grateful to them for their gesture. Also special thanks to Samina Gardezi of San Ramon, Mr. & Mrs. Abdus Sattar Ghazali of Fremont and Mr. & Mrs. Talat Mahmood of Modesto, and Sohail Anwar family from Elk Grove for driving from that far distant to attend the picnic. As the word is getting out all supporters of peace and harmony are taking a notice and supporting AMV's activities. Community leaders from Davis California, Drs. Zakauddin & Shireen Vera of Davis not only attended the picnic, Dr. Shireen gave very useful advice to young ladies of Woodland community who were present at the park. They plan to work with and support American Muslim Voice very closely and we are looking forward to it. Mr. & Mrs. Talat Mahmood of Modesto also expressed deep in actively supporting AMV’s mission and also having a peace picnic in Modesto. A bright young man Shahzad Anwar, an IT specialist who is fairly new to Woodland area and he works with legislative branch on the State Capital in Sacramento attended the picnic and plans to join AMV's volunteer force to work and support community building mission of American Muslim Voice. Many individuals not only worked very hard in planning and execution of the event, they financially supported it as well. A special thanks to Riaz Ahmad, President Islamic Center Woodland, Muhammad Saleem, member board of directors Woodland Islamic center, Principal Islamic School Woodland mosque and AMV Woodland chapter President Muhammad Usman Sadiq for their awesome dedication to always be on the forefront, work hard and make it happen. The other people who helped in making the event successful include Muddasar Rifaqat & Mubashar Rifaqat, Umar Saeed, Rizwana Saleem, Abdul Farooq, Faisal Nadeem, and our musician & sound engineer Abrar Ali who is always there to help in any activity when we need him. 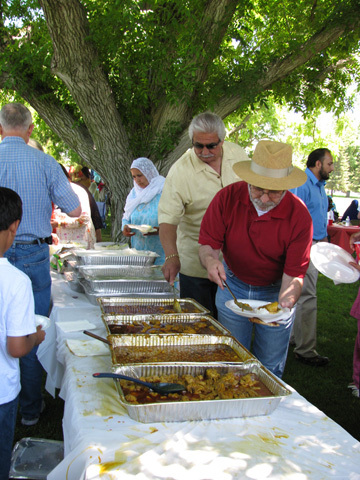 Special thanks to Mian Mohammad Anwar, proprietor of Shaz Restaurant, Sacramento, that provided subsidized catering.